At one point, Lynch apparently pulled out a bag of Skittles and started eating them during his speech. PHOENIX, AZ – Attendees of the weekly Friday prayer service at a local mosque were puzzled by the surprise visit of NFL Star Marshawn Lynch. 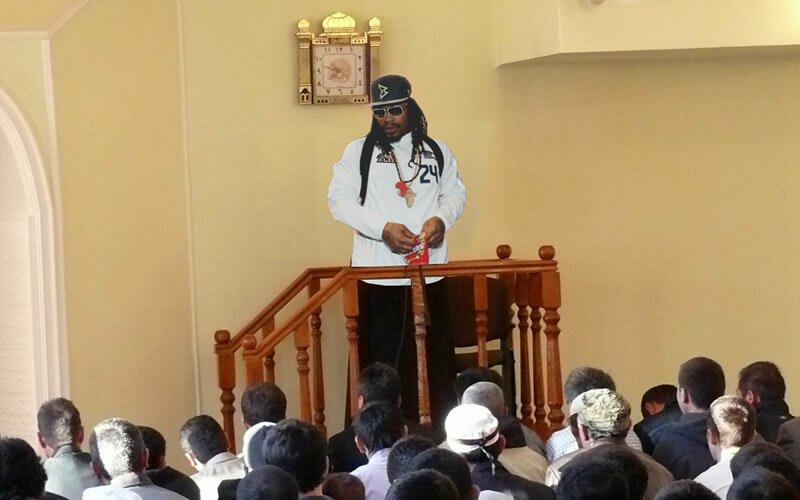 As part of his recently inked sponsorship deal with the Islamic center, Lynch was obligated to deliver their weekly Friday sermon. “At first I was like, did he convert? Then I saw him walking toward the podium and I got really confused,” stated one eyewitness. Further complicating matters was a crowd of reporters who followed the NFL’s 4th leading rusher into the facility. Tensions flared when Lynch and several reporters refused to take off their shoes prior to entering the prayer hall. Things escalated as reporters repeatedly questioned Lynch during the sermon. For approximately 40 minutes, the running back repeated the phrase, “I’m just here so I don’t get fined.” At one point, Lynch mistakenly went into “beast mode” requiring him to re-perform the obligatory “wudu” cleansing and restart his sermon. Afterward, the athlete fumbled his way leading the prayer with a series of slaps, grunts and twirls. Many also noted Lynch’s speech was much better than the one given last week by a half-naked, blood-drenched Marilyn Manson.